When it comes “community,” the care and compassion one finds at St. Anne’s Retirement Community reaches far beyond our doors along Columbia Avenue. 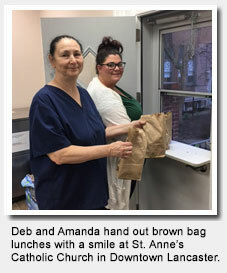 Over the past four years, our Catholic-Centered senior living community has been involved in the Brown Bag Lunch program at St. Anne’s Catholic Church. Located in Downtown Lancaster, St. Anne’s Catholic Church distributes lunches, free of charge, to community members in need. The Brown Bag Lunch program serves approximately 80 to 120 individuals, Monday through Friday, with the help of countless volunteers from organizations throughout Lancaster County. “The program is utilized by people who are down on their luck. Volunteers don’t ask questions and the recipients are very respectful and thankful for the meal,” says Dan Lytle, who coordinates St. Anne’s Retirement Community’s involvement in the program. Four times a year, volunteers from St. Anne’s Retirement Community roll up their sleeves to help with the Brown Bag Lunch program on the last Friday of each quarter. Meals are packed in the retirement community’s kitchen by a crew of employees, Residents and Sisters of the Adorers of the Blood of Christ on Thursday for distribution on Friday. When Dan Lytle asks for help with preparing the lunches, the response from the retirement community is so great, he usually has to turn away volunteers. “I enjoy packing the lunches because so many people here want to help do it. There is love, a lot of love, packed into each of those brown bags. I am always amazed at all the people who want to pitch in,” says Dan of the Residents, Employees and Sisters who volunteer to help with the program. care, and participation in the Brown Bag Lunch program as an extension of that mission. As for our Employees, Residents and Sisters who assist with preparing and distributing the meals, they too feel special to be a part of it. 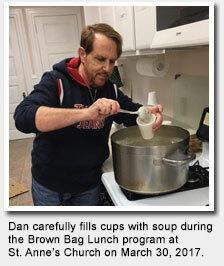 The Brown Bag Lunch Program offers an afternoon meal to local residents in need on weekdays at St. Anne’s Catholic Church on Duke Street in Downtown Lancaster from 11:30AM to 1:00PM. For more information about the program, visit http://stannechurch.org and select “Brown Bag Lunch” under the Outreach menu.